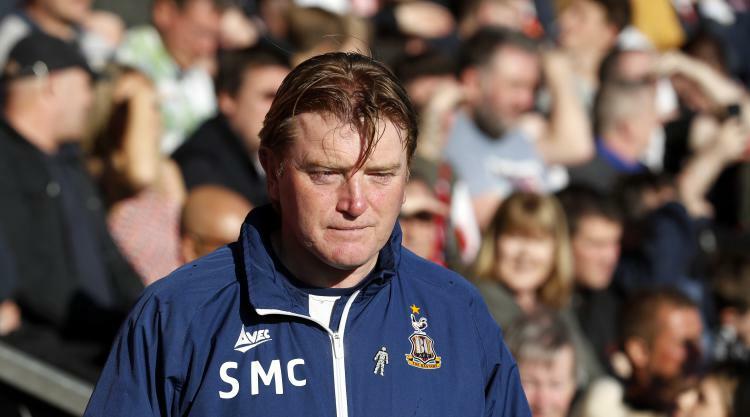 Bradford boss Stuart McCall was devoid of nerves as his side negotiated their way to Wembley for the third time in four years by advancing through their Sky Bet League One play off semi-final against Fleetwood. Holding a slender one-nil lead given to them by Rory McArdle's header in Yorkshire three days earlier, the Bantams saw out a dull 0-0 draw in the second leg at Highbury on Sunday to set up another Wembley date against Millwall in the final. Bradford were last there in 2013 for the League Cup and League Two play-off finals and will meet the Lions hoping to avenge their loss to them in last year's semi-finals. They have since been taken over by new German owners and reappointed McCall, who claimed he managed to stay calm despite a tense contest at Fleetwood where the hosts only needed one goal to take the game into extra-time. "I know the fans were edgy and nervous but my lad asked me this morning if I was nervous, I wasn't with the team I picked and the squad I've got," he said. "This was the aim, we said it at the beginning of the season, let's see if we can go one better than last season. It was going to be a big ask after g etting beat in the play-offs and then Phil (Parkinson) leaving, because he's a top manager. "We've come in and brought our own side and staff - the players that were here have been outstanding and the players we've brought in have been terrific." McCall may have been kept cool by Bradford's below-par opponents, who failed to truly trouble goalkeeper Colin Doyle over the two legs. Cod Army manager Uwe Rosler tried tweaking both his system and personnel in a bid to break down a resolute Bantams back-line, yet the best opportunity fell to the visitors' Charlie Wyke when he headed against a post in the first half. "I'm really proud of the players," McCall added. "We knew over two legs it would be really tight. It was the two second-best defensive records in the league behind Bolton. "We said the other night, 1-0 we would be delighted with. You've always got a chance of losing a goal any time but the desire, commitment, what they've shown all season, nobody can point a finger at their effort. "I'm just so pleased for the fans to send them home happy, for the city of Bradford to look forward to Wembley and we'll give it everything. The players deserve outstanding credit." That Fleetwood were even at this stage was remarkable given their ascent through the Football League pyramid, and they were at the ninth level when Bradford were last a second-tier club in 2004. There was still a possibility they could have gone up automatically on the final day of this season, 12 months on from a last-gasp survival job, and the work Rosler has done has earned him admirers, with a link to Norwich mooted for some time. Asked about his future, the German said: "I have a clear message - I have one more year left on my contract and I'm sure the club will talk to me regarding my future. "Then we'll see what happens. I'm planning. We'd already started to plan and put things in place. I'll have two days off - two days' sleep - and from Wednesday onwards we'll start for next year. "We have to speak and find out what the expectations are next year, find out what the framework is. We have to recruit, have to understand that the expectations are rightly rising from our supporters."